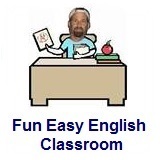 ﻿ Fun Easy English - new classroom free online classes english language lessons speaking listening writing reading october. 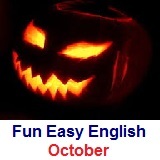 Celebrate Halloween and learn all about this holiday. Grammar focus is on punctuation. October 14 - Columbus Day - Test your reading comprehension about Columbus Day. October 24 - United Nations Day - Test your reading comprehension about United Nations Day. October 27 - Diwali/Deepavali - Test your reading comprehension about Diwali/Deepavali.